Silver Cascade Falls is a waterfall located on St. Mary's Creek in the North Cheyenne Canon Park of Colorado Springs, Colorado. Silver Cascade can be reached by hiking a short but steep trail up from North Cheyenne Canyon road at the Helen Hunt Falls trail head. The trail is less than half a mile, but steep in places and the footing can be slippery, especially when wet or when frozen over during the winter months. Care should be taken especially at the top of the falls, as the granite face of the falls is polished, slippery, and much steeper than it appears. The falls have an interesting spout feature about 50 feet below the crest due to an upturn in the rock face. During high flow times, the spout can shoot water over 10 feet off the rock face. The water running over Silver Cascade originates in Buffalo Canyon, passing over St. Mary's Falls and Silver Cascade Falls before merging with North Cheyenne Creek down stream of Helen Hunt Falls. 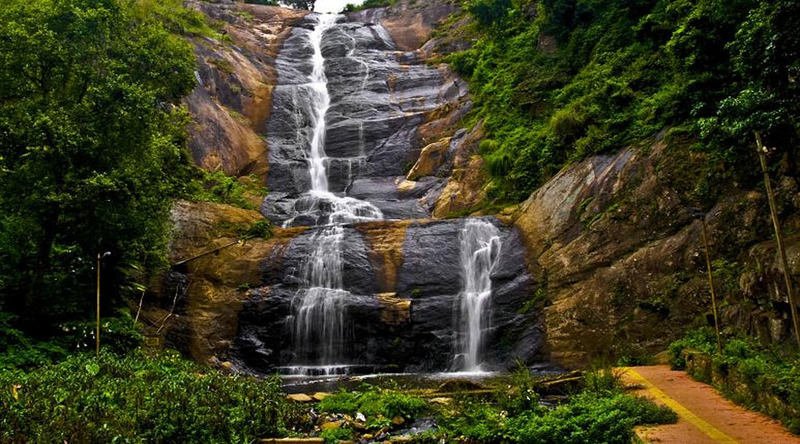 While on your journey from Kodaikanal to Madurai by road, you are confronted by the stunning sight of water thrashing down from 180 feet right into the ground below and mesmerizing one and all with its sheer strength and beauty. The fruit sellers selling exquisite, mouth-watering fruits which you can buy and enjoy under the falls is an experience unmatched.